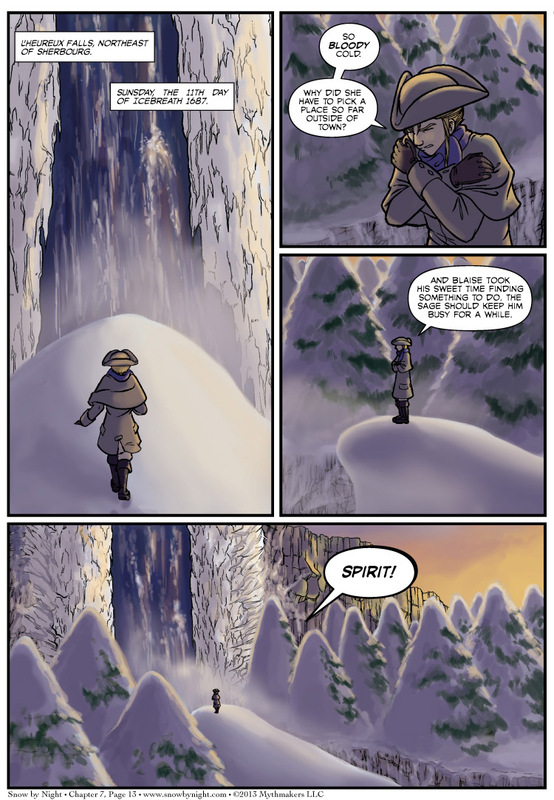 On Chapter 7 Page 13, we return to L’Heureux Falls, but this time it is Jassart calling out to Snow-by-Night. This can’t end well. 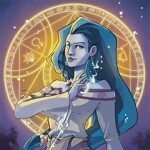 To see a preview of how Snow-by-Night responds, please vote for Snow by Night on Top Web Comics. The waterfall’s ice wings are spectacular! Love this comic, I really do. The art style just goes so well with the story. Thank you so much! I’ll pass along your compliment to Brittany and Naty, the artists. You know, Snow would be entitled to take Jassart’s heart at this point. He clearly isn’t using it. But if Snow takes his heart, she’ll be just like him; greedy, corrupt. No, Snow shouldn’t take his heart. So because he doesn’t give a damn about a dangerous spirit, Jassart’s a bad guy? Because he’s selfish, self-centered, vain, egotistical, materialistic and rationalizes doing things that are in his personal interest as “helping” his friend or his girfriend, he’s a bad guy.